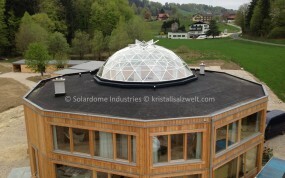 The challenge To provide a glass geodesic dome skylight for a new contemporary wellbeing facility in Austria. The founders of KristallSalzWelt (Crystal Salt World) had a vision to create a contemporary wellbeing facility that was both architecturally striking, and also a place that enabled the team to live and work in harmony with the natural environment. All on a 9,000m2 site on the shores of Lake Attersee in Austria. Diana Hollacher, co-founder and project architect, believes that buildings should help people to connect with nature. Her beliefs, as well as her passion for geometry and ancient building philosophies, were fundamental to the design of the building and the specification of a geodesic dome skylight to cover the central two-storey atrium of their new building. 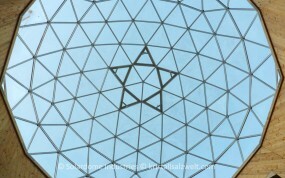 The skylight requirements were to provide a central feature, maximum light, complete weather protection from the high winds and snow loading of the Austrian climate and fit over the atrium of a unique 12-sided, 8.3m tall building. A SOLARDOME® PRO skylight, custom designed and manufactured, using the SOLARDOME® PRO architectural system, to fit the dimensions for a central circular two-storey atrium. The incredibly strong and robust geodesic design is able withstand the potentially damaging wind and snow loading pressures in Austria. Once onsite, the 9.3m diameter, 2.7m tall PRO skylight took just a week to install and glaze. Designed to European standards, the completed PRO skylight contains 75 double glazed panels, five digitally controlled vents and almost 200 metres of recycled aluminium. With a structural lifespan of over 100 years the aluminium frame means the dome is virtually maintenance free. 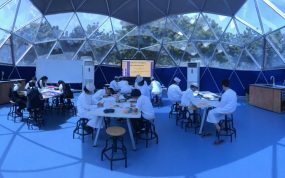 Leading private school in Oman chooses Solardome Industries to bolster their impressive curriculum.